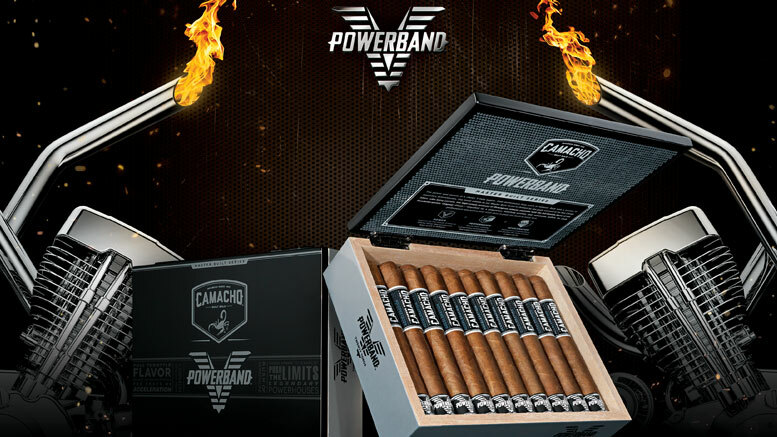 Camacho Powerband™ is an intense, adrenaline-fueled cigar experience inspired by the power, performance and acceleration associated with a classic V-twin engine, built to galvanize a brotherhood of freedom seekers. Built with a tandem of legendary powerhouses, the latest edition in our Master-Built Series is defined by the high-octane intensity of Nicaraguan tobacco and the full-throttle flavor of our Honduran grown Original Corojo. Like firing pistons, the push and pull of these two supercharged fillers is amplified by a proprietary Powerband™ bunching process that maximizes airflow for peak performance. Camacho Powerband™ is built with tobaccos from five different origins, the cigar starts with intense notes of chili pepper and a pronounced oak note on the palate. The experience further intensifies in flavor as the twin Corojo ligeros in the filler begin to rev up. In the second third, the cigar begins to down shift as performance peaks and sparks of dark coffee and cocoa become present on the retrohale. In the last third, the cigar accelerates reaching near redline. Camacho PowerbandTM will begin shipping in the US on Monday, June 13th and across global markets in May 2017.